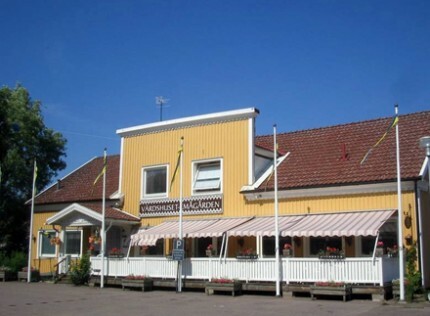 Our hotel is located in central Högsby just 200 metres from the travel centre, with direct train connections to Kalmar and Stockholm and other destinations. We provide both nourishing home-cooking and exciting meals for receptions and parties. We arrange all kinds of events of up to 150 people in an old and delightful fully licensed country-inn environment. Eight splendid guest rooms are at the disposal of the tired traveller or the summer tourist who has been captured by the unbelievably beautiful and pleasant environment of the Högsby region. Broadband connection in all rooms. The Emån stream winds through the community. You will find Sweden's largest mistletoe clump at Berga manor farm, and the unchanged village of Drageryd is not far away. No new servings in last half-hour before closing. Other times by arrangement.